Coverage: Live radio and text commentary on all Andy Murray matches, plus highlights on BBC TV and BBC Sport website. Listen to Tennis Breakfast on Radio 5 live sports extra and the BBC Sport website from 07:00 GMT. 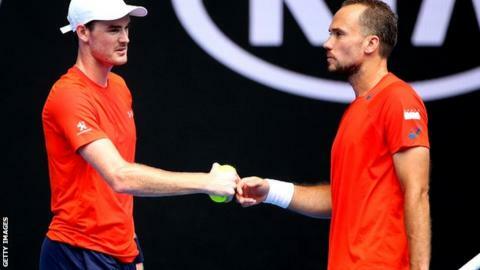 Britain's Jamie Murray is through to his third consecutive Grand Slam doubles final after he and partner Bruno Soares won their Australian Open semi-final in straight sets. The Scottish-Brazilian pairing saw off France's Lucas Pouille and Adrian Mannarino 6-3 6-1 in Melbourne. They will face Canada's 43-year-old Daniel Nestor and 37-year-old Czech Radek Stepanek in Saturday's final. Murray reached the Wimbledon and US Open finals with John Peers in 2015. "I'm starting to get the hang of this game, I think," said Murray. "It took me a long time to understand what it took to win, and to perform at optimum level every time you step on the court. "I've been lucky, I had a great partner for the last few years in John Peers and am now starting a new journey with Bruno here. "It's been a great two weeks for us and hopefully with one more match we can get over the final hurdle." Murray, 29, is the first Briton through to a final in a successful tournament for British tennis. Johanna Konta lost in the women's singles semi-finals, while Andy Murray, Jamie's younger brother, plays Milos Raonic in the men's last four on Friday. "Somebody must be doing something right over in the UK," said Jamie Murray. "It's been great. Andy's obviously been doing amazing things for a long time and what Jo's done this week has been quite unbelievable." Murray, who split with Australian Peers at the end of last season, won the Sydney International title with Soares in the build-up to the Australian Open. Soares, 33, is a two-time Grand Slam mixed doubles champion and through to his second men's doubles final, having finished runner-up at the 2013 US Open with Alexander Peya.